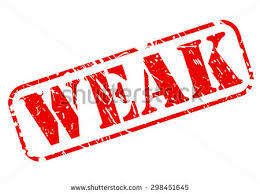 Well folks we have been saying all along that Trump is weak and yesterday he now only showed how weak. He showed that he has taken the MOST POWERFUL COUNTRY EVER, and brought the USA DOWN TO ITS KNEES, dumped our allies and is now on his knees groveling to Putin to help make us great again. This is NOT acceptable and get ready for the BIG CON. He will now set out to con all of us with some kind of made up story that he is not weak, will continue to lie and make up nonsense. He will get his cronies to spin lies and continue on disregarding the law of the land and wiping his feet on the Constitution. We need our one time allies more than ever and we need the patriots of our country to stand up to overcome Trump and his co-conspirators (GOP) almost overwhelming negative energy. The negative energy Trump is carrying is the same energy that destroyed Atlantis, brought down Rome, destroyed the Mayans, destroyed the Aztecs, and created Adolf Hitler. Folks, this negative energy destroys everything in it’s path and now it’s here on our doorstep. This negative energy has been hanging around for years and it’s all part of the issues that politicians want to go away. Back when John F Kennedy and Lydon Johnson attempted to sure Civil Rights they did pass some laws but not enough and the negative people added to the snowball of neg. energy. Martin Luther King tried to get more done and many people gave their lives for a solution to Civil Right for all, but the politicians were more concerned on getting re-elected than our countries well being of the people. All of that is rolled up into the snowball. Then came George W. Bush who stood around with a blank look when 911 happened and then created a huge lie that Iraq has weapons of mass destruction and were involved in 911 when in fact there we not involved in 911 and the countries that were, got off Scott free. Then Katrina, and they once again stood around like deer in head lights. And then the financial crisis where the DOW eventually got to 6,000, and they had no idea what to do. More negative energy building up. Then came Barrack Obama who actually saved our countries economic collapse and made some tough decisions and his positive energy and his caring for our country was just what we needed. It took him years to get up back to a somewhat stable country and even now, but then came Trump who seemed to have a open hatred of Barrack and started removing all the Executive orders that Barrack put in place. You know because you are here, so don’t look the other way ans think you can’t do anything about him. Your VOTE is more powerful than any one man or woman or other. So people we need someone to step and become a STRONG LEADER to bing us back to the powerful country we once were and to get back to ALL or friends to make an alliance more powerful than any one country. We need solutions to civil rights, health-care, and peace. We don’r need the lies from Trump and his mob. Come November we can get rid of the scum and get some new an innovative people to represent us in Washington. People who care about our country and the people in OUR country. Then in 2020 another election for the presidency. Same thing, we need solutions NOT LIES. Let talk NOW! In this moment we will start bring all the positive energy to this crisis. We hope to see President Obama start speaking out with solutions and maybe the Democrats will stop blaming Trump and come up with some creative solutions. We need the Democrats to define what their platform is or will be in 2020, because if it’s not what the people want we can go elsewhere and look at the Independents. You snicker when Independents is mentioned, but if a really strong positive force comes along and runs as an Independent then nothing will stop that person from becoming the STRONG PRESIDENT we need for solutions. It’s time for the positive people to come together in our county and become one to overcome the crud and scum that is currently in Washington. “We the people…..” our Constitution starts with and We the people shall take back our country and take care of all the people in our country. We shall lead the world to peace solutions and come together as one for all the world. We have no limits folks, we can do anything we choose and if its good for all “Thy shall be done.”.